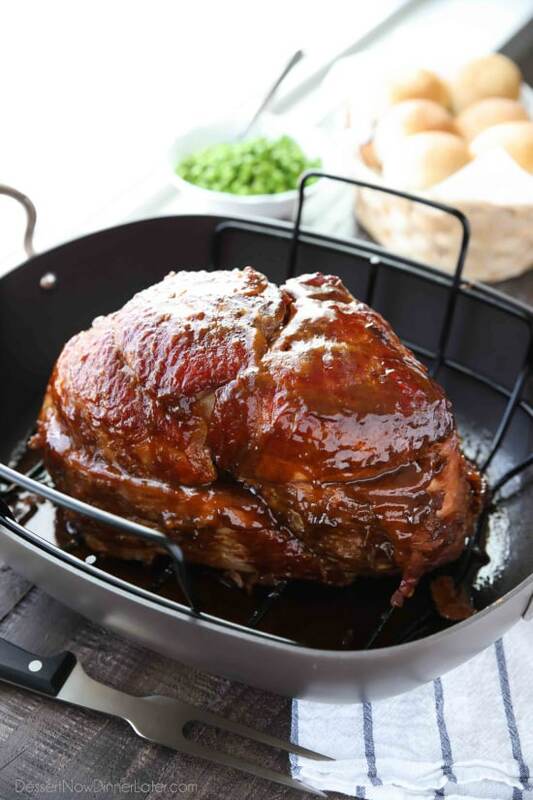 Brown Sugar Mustard Glazed Ham - Dessert Now, Dinner Later! 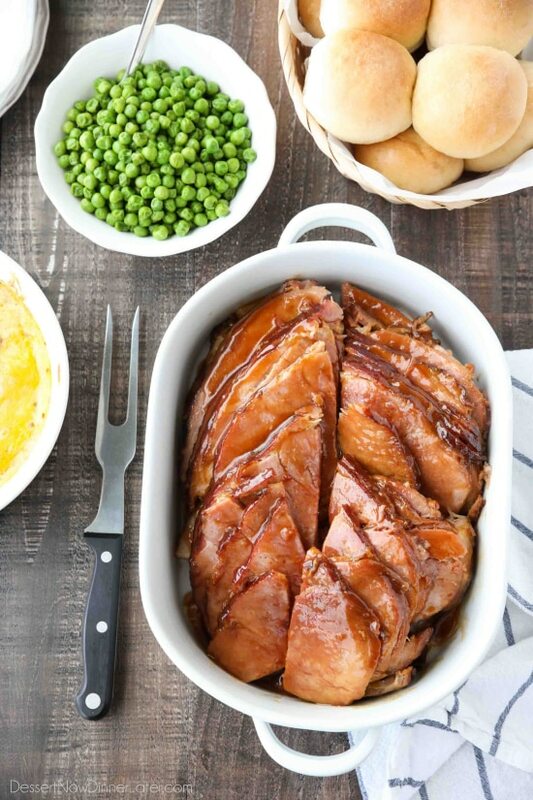 Brown Sugar Mustard Glazed Ham is super easy to make with only a few common ingredients for a thick, sticky glaze. No pre-cooking the glaze. Just mix, slather, and bake. It’s the easiest holiday ham! The brown sugar mustard glaze on this ham almost doubles as a gravy because it is thick and saucy. 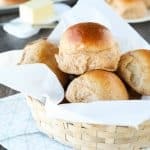 Plus, it’s super easy to make with just a few simple ingredients. I actually got this brown sugar mustard glazed ham recipe from a friend in college, and I couldn’t believe how easy it was to make. My kids will eat it and ask for seconds, and then thirds, and stuff themselves silly. It’s so good! Before we get started on the glaze recipe, let’s talk about ham! 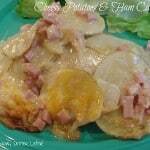 For this recipe, you will want to purchase a fully cooked, bone-in, spiral cut ham. Bone-in: The main differences between bone-in hams and boneless hams is the taste and texture. Like most meats, cooking with the bone makes it more flavorful and moist. Bone-in hams also have better texture. Boneless hams are pressed back together so there are no holes where the bone used to be. This can create a bit of a spongy texture. Spiral Cut: Most bone-in hams come spiral cut, which means they are pre-sliced in a continuous spiral all the way around the bone. This creates thin slices that makes cutting and serving the ham much easier. The only downside is pre-sliced hams tend to dry out easier. 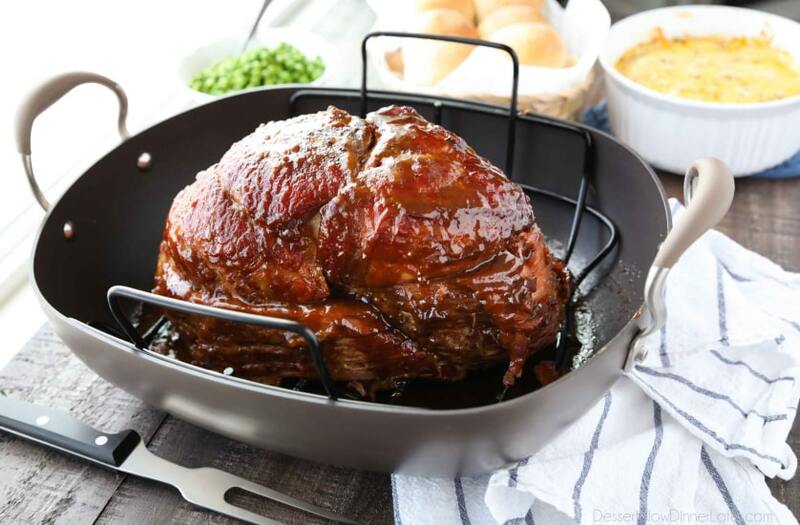 TIP: To help keep your ham moist and juicy, place the ham cut-side down in a baking pan and tent it with foil. Whole, bone-in hams typically weigh between 8 and 18 pounds. Estimate about 3/4 pound of bone-in ham per person. It might seem like a lot, but you have to account for the weight of the bone. Plus, it never hurts to have leftovers to send home with your guests. Cubed leftover ham also freezes well to use for future recipes. 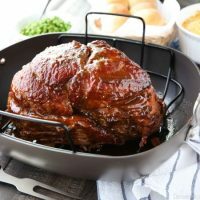 For this brown sugar mustard glazed ham recipe, you will want to put 1 cup of water in the bottom of a roasting pan fitted with a rack inside. A rack is preferred to provide air-flow and even heating. If you don’t have a rack, add some onions and carrots to the bottom of the pan to prop your ham up. 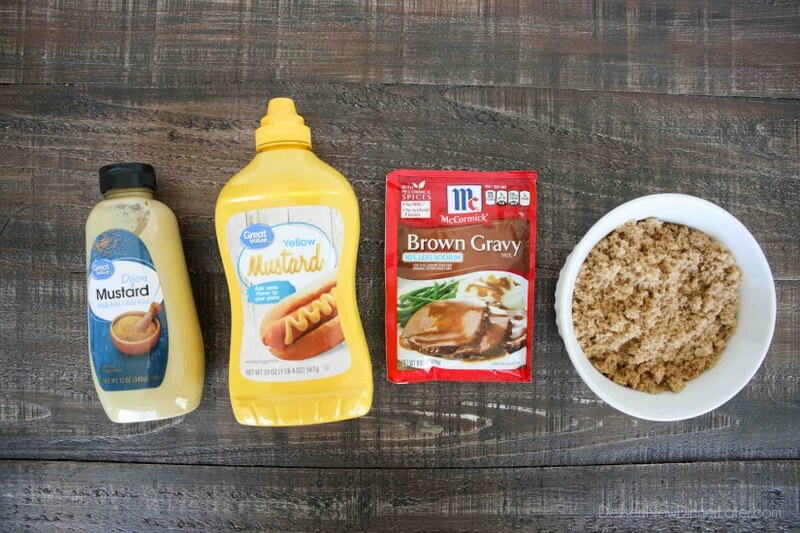 The ingredients for the glaze are simple: mustard (yellow, dijon, or some of each), a brown gravy packet, and brown sugar. Simply mix all of the ingredients together to form a thick paste, and brush it on top of the ham. Save about 1/3 of the glaze for later. Make sure the ham is cut-side down onto the rack or bottom of the pan. 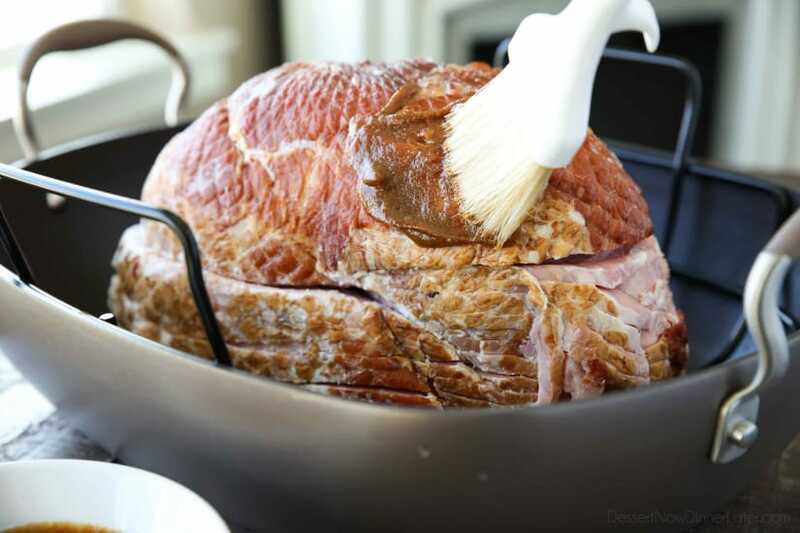 Cover the ham completely with foil covering the edges of the pan so no steam escapes. This will help to lock the moisture in, so your ham doesn’t dry out while it cooks. It also prevents the glaze from burning. You can tent (create a fold in the center of ) the foil to keep the glaze from sticking to the ham, or just use extra foil and keep it loose on top. WHAT TEMPERATURE TO COOK HAM? Since we are starting with a fully cooked, ready-to-eat ham, we are simply reheating a ham that’s already been cooked. For that reason, a lower temperature of 325 degrees Fahrenheit is ideal to not dry out the ham. Be sure to THAW your frozen ham in the refrigerator for 2-3 days before you want to cook it. It will take about 4-6 hours per pound to thaw completely. 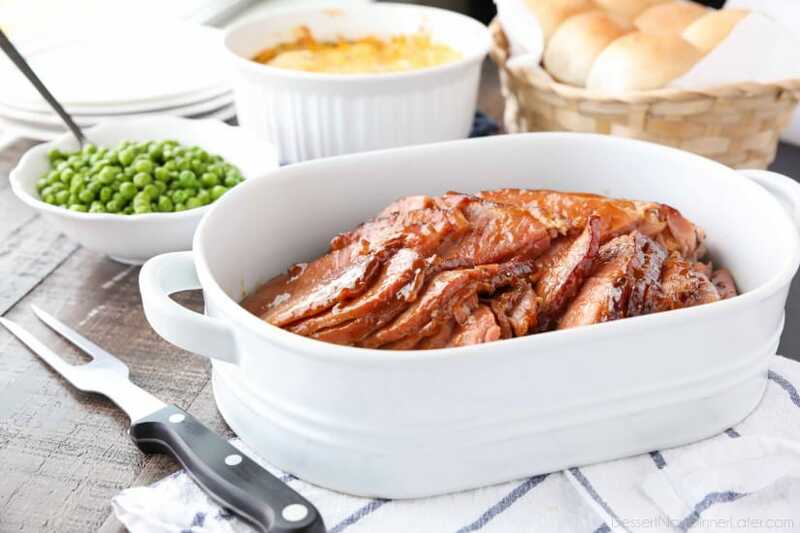 You will also want to remove the ham from the refrigerator and let it rest at room temperature for 1-2 hours before baking, to take some of the chill out before heating it up. This also helps with more even cooking and browning. The food-safe internal temperature of a reheated ham is 140 degrees Fahrenheit. I will reheat my ham to 135˚F and leave it covered in the pan. The temperature of the ham will continue to rise during carry-over cooking. A programmable meat thermometer with a probe, cable, and timer is desirable and efficient for reheating ham to the proper temperature. You will insert this into the center/thickest part of the ham, taking care to be near the bone, but NOT touching it. You can set the timer to the desired temperature (135-140˚F), and the thermometer will sound an alarm once the temperature has been reached. This helps keep the oven temperature consistent by preventing the need to open and close the door (besides when basting) to check the temperature. If you use this type of thermometer, you will stick it in before covering the ham and pan completely with foil. The cord should be long enough to reach outside of the oven where you can set the timer on the floor or counter, depending on how long it reaches. Some thermometers also have magnets so that you can stick it onto the outside of the oven. If you’re starting with a fully cooked bone-in ham, plan on it taking about 10-15 minutes per pound to cook the ham in a 325˚F oven. Remember: To help keep your ham moist and juicy, place the ham cut-side down in a baking pan and tent it with foil. Once the ham has reached 100-115˚F or about 30-45 minutes left of cooking, I like to nuke the remaining glaze in the microwave for 30-60 seconds to soften it up. Then spoon it over the top of the ham with some of the juices from the bottom of the pan. Re-cover the ham with foil and continue cooking until it is completely heated through. Allow the ham to rest for 5 minutes before slicing. The bottom of the pan should be filled with a thick, saucy glaze. After the ham is sliced, I like to pour this sauce over all of the slices so everyone gets a little. It’s just enough to lightly dress the ham and makes it so good! 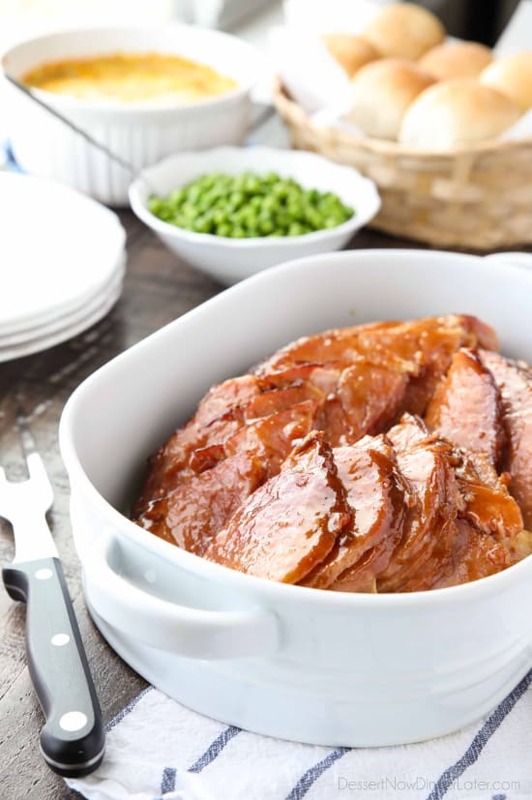 This brown sugar mustard glazed ham is so easy and will be well received by your guests. Perfect for holidays like Easter or Christmas! 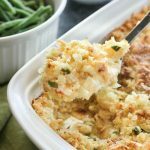 Serve it with Funeral Potatoes, Whole Wheat Dinner Rolls, your favorite veggies, and some Raspberry or Orange Fluff Fruit Salad. Enjoy! Brown Sugar Mustard Glazed ham is super easy to make with only a few common ingredients for a thick, sticky glaze. It’s the easiest holiday ham! **Be sure to THAW your frozen ham in the refrigerator for 2-3 days before you want to cook it. It will take about 4-6 hours per pound to thaw completely. Remove the ham from the refrigerator and let it rest at room temperature for 1-2 hours before baking, to take some of the chill out before heating it up. This also helps with more even cooking and browning. Preheat oven to 325˚F. Lower rack in oven, if needed, to have adequate room for the ham. 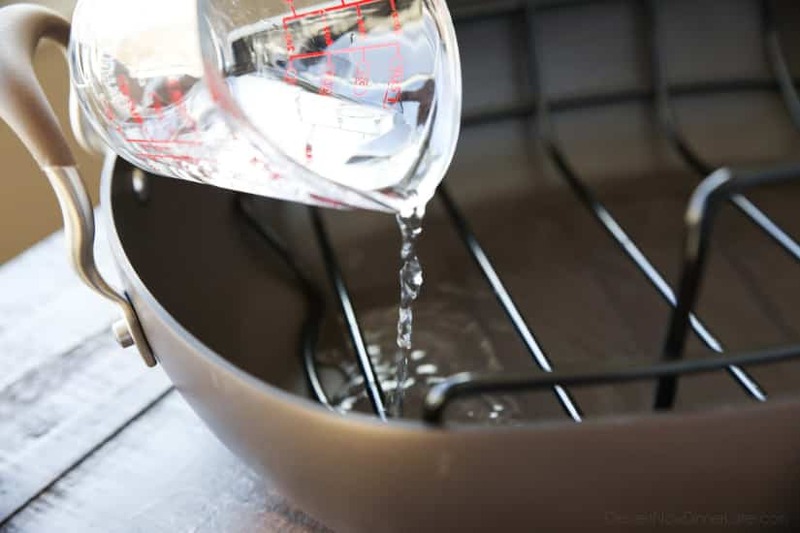 Put 1 cup of water in the bottom of a roasting pan with a rack. Remove ham from packaging, and place cut-side down onto the rack. In a large bowl, stir together the brown sugar, mustard(s), and brown gravy packet. (It will be a thick paste.) Brush onto the outside of the ham, saving about 1/3 of the glaze for later. If using a programmable meat thermometer, insert the probe into the center/thickest part of the ham, taking care to be near the bone, but NOT touching it. Cover the ham completely with foil covering the edges of the pan so no steam escapes. (Leave the cable and the thermometer’s base outside the pan.) This will help to lock the moisture in, so your ham doesn’t dry out while it cooks. It also prevents the glaze from burning. You can tent (create a fold in the center of) the foil to keep the glaze from sticking to the ham, or just use extra foil and keep it loose on top. Set the timer to the desired temperature (135-140˚F), and the thermometer will sound an alarm once the temperature has been reached. 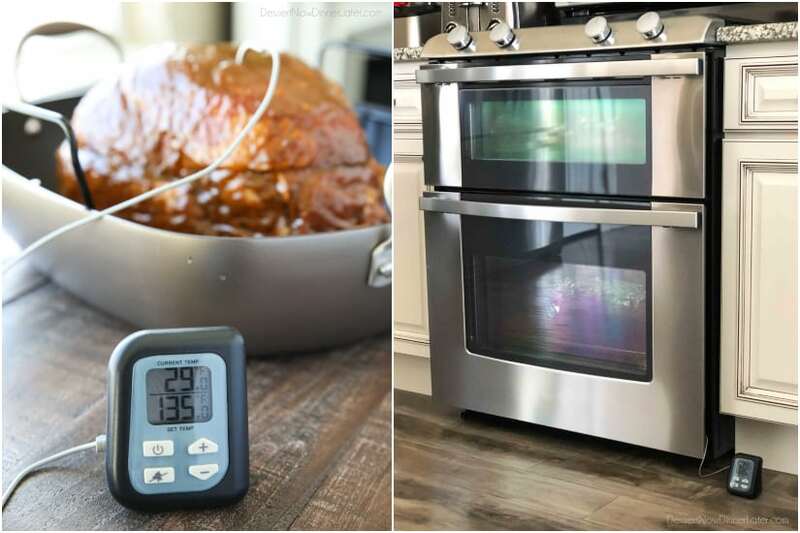 If not using an oven-safe meat thermometer with an alarm, plan on the ham taking about 10-15 minutes per pound and use a digital thermometer to ensure the food-safe temperature for ham (140˚F) has been reached. BASTING: Once the ham has reached 100-115˚F or about 30-45 minutes left of cooking time, nuke the remaining glaze in the microwave for 30-60 seconds to soften it up. Then spoon it over the top of the ham with some of the juices from the bottom of the pan. Re-cover the ham with foil and continue cooking until it is completely heated through. Allow the ham to rest for 5 minutes before slicing and serving. The bottom of the pan should be filled with a thick, saucy glaze. After the ham is sliced, I like to pour this sauce over all of the slices so everyone gets a little. 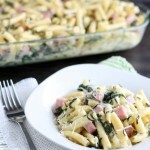 It’s just enough to lightly dress the ham and makes it so good! Enjoy!